Recent space observations challenge the current cosmological theory, raising inconvenient questions. Scientist play the pesky inquiries down, citing statistical quirks. Under the current cosmology model, known as λCDM, dark matter, which makes up a vast majority of the known universe, creates a sort of gravitational framework, influencing the movement of our galaxies and other large objects in space. Cosmologists love this model because it answers a lot of questions and works well. However, one of the consequences of the λCDM model is that so-called dwarf, or ‘satellite,’ galaxies, should orbit a host galaxy like a cloud, a ball, or, for a better scientific analogy, like electrons around the nucleus of an atom. But they don’t. 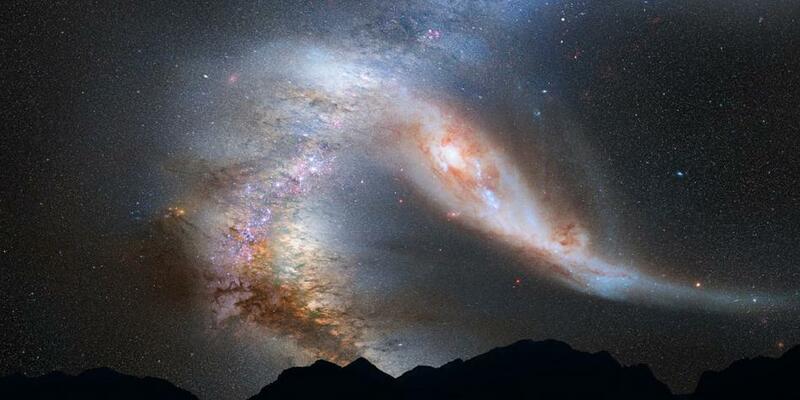 According to a review by Ars Technica, two closely observed galaxies — our Milky Way and our nearest galactic neighbour the Andromeda Galaxy — have their smaller satellite galaxies arranged like a disc. Yes, those satellite galaxies more or less orbit their hosts in a plane, like planets orbit the stars. Why does it happen? Cosmologists admit: they don’t know. “There is no obvious answer, unfortunately, or maybe expectedly — otherwise planes of satellite galaxies would not be seen as a problem and we wouldn’t talk about them as much,” said astrophysicist Marcel Pawlowski of the University of California, Irvine, who co-authored the study with fellow astrophysicist Oliver Müller of the University of Basel and other colleagues. “It would take very strong evidence of an insurmountable problem to give up on λCDM, or at least a model that looks very much like it,” said astrophysicist Mike Boylan-Kolchin of the University of Texas, who commented on the study.